conventional motor oil manufacturers recommend oil changes every 3,000 miles, AMSOIL synthetic motor oils protect engines for up to 25,000 miles (up to 50,000 in diesel applications) or one year, dramatically extending oil change intervals. Lubrication is necessary for the internal combustion engine to function. According to the U.S. Department of Energy’s Pollution Prevention Requirements, the first step in revitalizing a cleaner nation is pollutant source reduction. 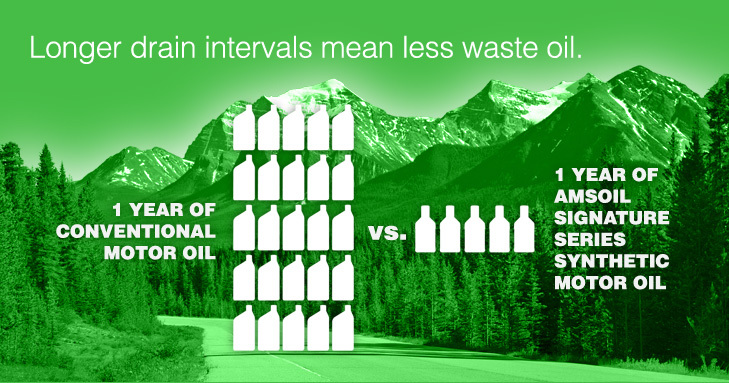 AMSOIL accomplishes this by extending the interval between motor oil changes beyond 3,000 miles, which can reduce the source of motor oil pollution more than eight times. volatilize (burn off) more readily than AMSOIL synthetic oils and create more emissions pollution. allow engines to use energy more efficiently. Maintains an ISO 140001:2004 Certification. AMSOIL takes environmental stewardship seriously and takes deliberate steps to minimize the company’s environmental impact. Because its Environmental Management Systems are registered to ISO standards, AMSOIL customers can be assured that AMSOIL is actively monitoring and reducing its environmental impact.